Finding Nemo Submarine Voyage in Disneyland packs much of the animated film's fun into a short trip. After you pass a coral reef and underwater city, you'll find Nemo and pals under the sea, with convincingly real film clips visible through the windows. Everyone seems to like it, but you'll enjoy it more if you saw and liked the movie. We polled 397 of our readers to find out what they think about Finding Nemo. 77% of them said it's a must-do or ride it if you have time. Fun factor: High for fans of the film, but some people think it's boring. Wait factor: High and Finding Nemo is not a Fastpass ride (for many reasons, among them no space for a station). Fear factor: There are moments of darkness and a simulated explosion during the ride, which could scare smaller children. Unless you judge that this will be a big problem for your child, the rest of the trip more than makes up for it. Some people also hate it when the sharks show up. Seating: You have to walk down a spiral staircase to get into the subs. Riders sit in rows, facing the windows, which you look through to see the undersea world. Accessibility: If you can't make it down the stairs, the Observation Outpost offers similar visuals and wheelchair and ECV users can stay in their vehicles. Enter through the main entrance. This is one of the most popular rides in Disneyland with long lines most of the time, and it does not have a FASTPASS option. If you have a ticket for Magic Morning early entry (or if you're entering at opening time on a non-Magic Morning day), you may want to head to Nemo first before the lines build up. They'll be more than 30 minutes long within a half hour of opening. The fastest way to get there is via the Downtown Disney entrance and taking the Monorail. One of the most interesting aspects of Finding Nemo from a technical standpoint is timing the sound. The ride moves slowly, and people in different parts of the cabin see different things - yet somehow they all hear just what they're supposed to and nothing else. Each submarine holds 40 guests. You might not like it if you're susceptible to claustrophobia. Very tall people can have trouble looking out through the windows. Ask a cast member for suggestions. If you're worried about being underwater, take a look at the subs running before you get on. Even though it will feel like they're underwater, they never submerge. If you're walking past Finding Nemo, look for the seagulls on the buoy in the lagoon. They're yelling "Mine!" Finding Nemo is a ride that's really nice at night. The original submarine voyage opened in 1959 and was loosely based on the USS Nautilus, the first nuclear-powered submarine, and its journey to the North Pole in 1958. The original closed in 1998 and didn't reopen until 2007. It took that long to find the perfect new story to tell. Finding Nemo Submarine Voyage features over 60 animated figures, 7,000 pieces of artificial foliage and 23,000 pieces of artificial coral in a 6.3 million gallon tank. Imagineers used more than thirty tons of recycled crushed glass to "paint" the coral and rockwork in the lagoon. 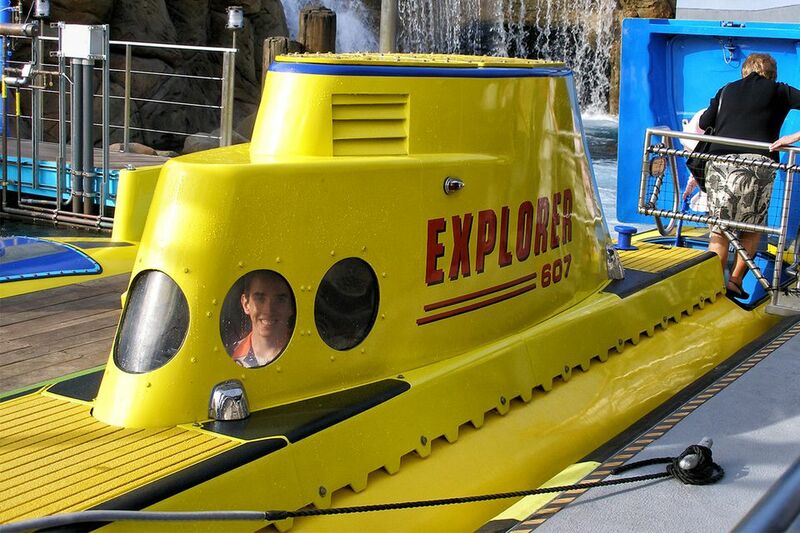 The ride uses the eight original 1959 vehicle hulls, which were built at the Todd Shipyards in San Pedro, California. But don't worry about going around in old equipment. In 2001, a naval engineering firm inspected the subs and discovered that they had forty to fifty years of life left in them.